Wednesday, November 21 at 5:00 p.m.
Monday-Thursday: 9:00 a.m. to 9:00 p.m. If you haven’t seen the light—or lights—then you will the next time you are in the library. We are now a mostly LED library, both inside and out. The brilliance of the new lighting is remarkable, especially in the 1985 portion of the building. The spine labels on bottom-shelf books are still a bit dim, but in most respects, we glow. Once again, the re-lighting of the library is part of the 2016 referendum results, or a reflection of those results. We will save money on utilities. And we will save Big Money on electricians’ services, replacing ballasts and fluorescent bulbs in high-flying fixtures in the 1995 building. As always, we are grateful to the public for entrusting us with public funds, which we have spent carefully. New paint, upstairs and down, should be evident by now. At first glance, the downstairs may seem over-the-top bright. On the other hand, consider a long, cold, gray January or February in central Illinois. Between bright paint and brilliant lights, the library may be the place to be for the light-deprived. Upstairs, the blue provides a soothing touch. A well-placed chair rail in the upstairs meeting/story time room should deflect bumps and scrapes. When re-lighting and painting are complete, the library will have spent the greater part of $800,000 received through the graciousness of the voters. All we need now is a building at least twice the size of the current one, and parking to match! (I do not lie, Scout’s honor—and I wasn’t even a Boy Scout.) But that will have to wait for another time. I am grateful for our public, the staff who have lived through moderate chaos, and a board willing to insure the safety and attractive qualities of what we do have. Oh—one more thing: We are planning the purchase and proper placement of an outdoor, drive-up book and video drop box. There is no convenient place in the main parking lot, so a drive-up drop will need to be in the staff/overflow lot, north of the library. Such a book drop used to be there, when the library faced north. But Airport Road, turn lanes, and the intersection with Garfield Avenue were different then. We will aim for safety in entering and exiting the north lot, with the location of a new drive-up book/video drop box. Stay tuned. Which is as it should be. As always, thanks for supporting your public library. Holiday Storytimes are held in six-week sessions throughout the year. Sessions may include books, fingerplays, crafts, songs, and games. Children should be the appropriate ages at the first class of each session. Wednesdays, 10 — 10:30 a.m.
Storytime for 2-year-olds with an adult. Tuesdays, 10 — 10:30 a.m.
Storytime for ages 3 to 6. Tuesdays, 10:30 — 11 a.m.
Wednesdays, 1 — 1:30 p.m.
Storytime for 2- and 3-year-olds with an adult. Thursdays, 10 — 10:30 a.m.
Evening storytime for ages 3 to 8. Thursdays, 6:30 — 7 p.m.
Monday, November 26, 2 p.m.
Monday, December 17, 2 p.m. Missing the camaraderie of summer reading club with your friends? Never fear—book club is here. 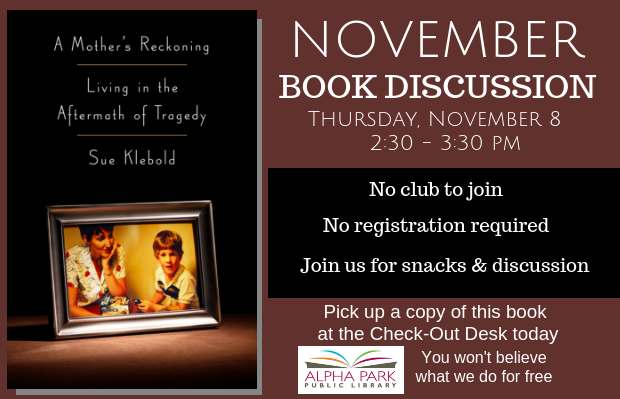 Join us once a month at Alpha Park Public Library for a youth book club. Each month we invite you to join us as we examine a favorite book, have a snack and do a fun activity to go with the book. ﻿Best for kids in 2—6 grade. Saturday, November 10, 10 — 2 p.m.
Saturday, December 8, 10 — 2 p.m.
Children ages 4 through 4th grade along with their parent or caregiver are invited to make a special holiday craft in the Youth Services Department anytime between 10:00 and 2:00 p.m. Parental assistance required. November’s craft is a turkey craft. December will be a Jingle Bell Cane or Felt Button Wreath. Tuesday, November 27, 3:30 — 5 p.m. Tuesday, December 18, 3:30 — 5 p.m. Attention architects! Third through sixth grade students can join their friends at the library for a building challenge and free design time. Materials will be provided. Registration is not required; come by and join the fun. Tuesday, December 18, 10 — 11 a.m.
Children six and under and their caregivers are invited to join their friends at the library for a special Christmas storytime including stories, songs, snacks, and a holiday craft. Thursday, November 1, 7:30 — 8:30 p.m.
﻿Thursday, December 6, 7:30 — 8:30 p.m. Teen Board members must be going into 7 through 12 grades and should have a library card. Meetings are held each month from 7:30 to 8:30 p.m. New members always welcome. Show up or call Youth Services at (309) 697-3822 x14 for more information. Thursday, November 8, 6 — 7:30 p.m.
(309) 697-3822 x14 for more details. Monday, December 3, 6 — 8 p.m. 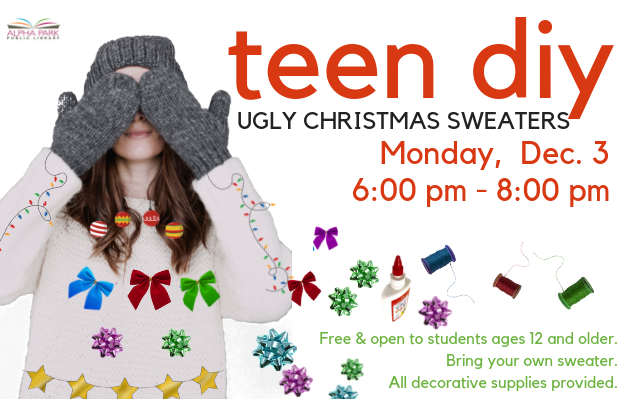 Teens, get ready to make your one-of-a-kind, totally unique ugly Christmas sweater! You bring the sweater. We’ll provide the ugly (while supplies last). No registration is required. Open to teens 12 years of age and older. Contact the Youth Services Deptartment at (309) 697-3822 x14 for more details. Monday, November 12, 7—8:30 p.m.
Monday, December 10, 7—8:30 p.m. Teens, join us for a new, monthly series investigating mental health topics as they apply to teens. We will meet with a professional who will share tips and resources and then have time for discussion and questions. In November, we’ll examine general mental health care and in December our topic will be anxiety. 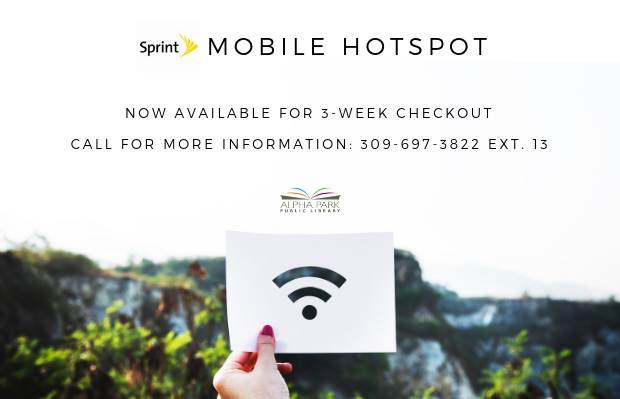 Call the Information Desk at (309) 697-3822 x13 to set up a time to get help with your device or learn how to download free eBooks or audiobooks from the library. It’s free and we’re way more patient than your kids! Wednesday, November 14, 6:30—7:30 p.m.
Thursday, December 6, 6:30—7:30 p.m. Learn how to download FREE audio books from your library just in time for the long holiday drive! This hands-on class will teach you everything you need to listen to audio books while on trains, planes, and automobiles! This is a FREE class and open to the public. Bring your device and your library card. Registration is limited to 10 people. Contact the Information Desk at (309) 697-3822 x13 to register. Thursday, November 29, 7 — 8:30 p.m. This class is designed to help you get to know your iPad better. The class will explore the basics, including how to change your settings, interact with the device, and discover the world of apps. Bring your iPad and let us know what tricks you’ve found! FREE class. Registration required. Contact the Information Desk at (309) 697-3822 x13 to register. Thursday, December 6, 2—3 p.m. This one-hour, hands-on class will teach you how to download FREE eBooks from the library. Bring your own device or laptop and your library card. This is a free class and is limited to 8 people. Please contact the Information Desk at (309) 697-3822 x13 to register. Tuesday, December 4, 6 —7 p.m. Learn how to use our new 3D printer! Take this class and you’ll be ready to set an appointment to print your own object. We will demonstrate how to print an object and provide instruction on the various functions of the printer. 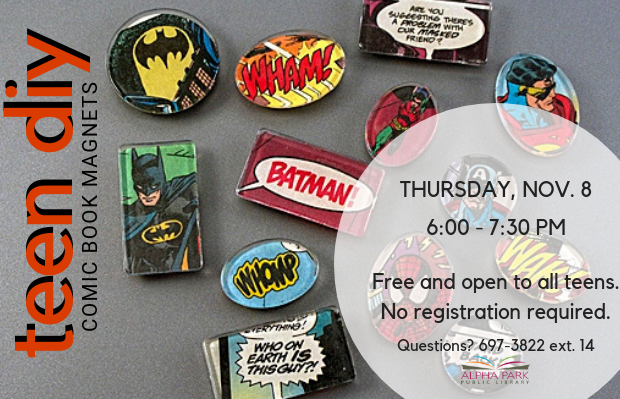 This free class is limited to 10 and registration is required. Contact the Information Desk at (309) 697-3822 x13 for more details. Tuesday, November 20, 6—7 p.m. Learn the basics of using your Kindle Fire tablet including how to connect to the internet, find and install apps, and check your email. Bring your Kindle Fire and let us know what tricks you’ve found! This FREE class is open to the public and limited to 10 people. Register by calling the Information Desk at (309) 697-3822 x13. Wednesday, December 12, 6—7 p.m. This one-hour, hands-on class will teach you the various skills necessary to make lists, add totals quickly, start a budget and more! This is FREE and limited to 8 people. Contact the Information Desk at (309) 697-3822 x13 for more details and to register. Thursday, November 8, 2 — 3 p.m. This one hour, hands on class will teach you the various skills necessary to write letters, type a resume, or create signs. Perfect for beginners or those needing a refresher course. Seating is limited to 8; please register at the Information Desk by calling (309) 697-3822 x13. We have two days for getting deals — Black Friday & Cyber Monday... On #GivingTuesday, we have a day for GIVING BACK! Celebrated on the Tuesday following Thanksgiving , Giving Tuesday is a charitable event in support of non-profits and local community. Help your library raise funds for items like new carpet in Youth Services, more comfortable arm chairs, and a 3D scanner. Donate at the library anytime or use the Facebook donate button! Please bring in new mittens, gloves, scarves, or hats for all ages to hang on our Angel Tree. All donations will be taken to Bartonville Grade School and the South Side Mission. 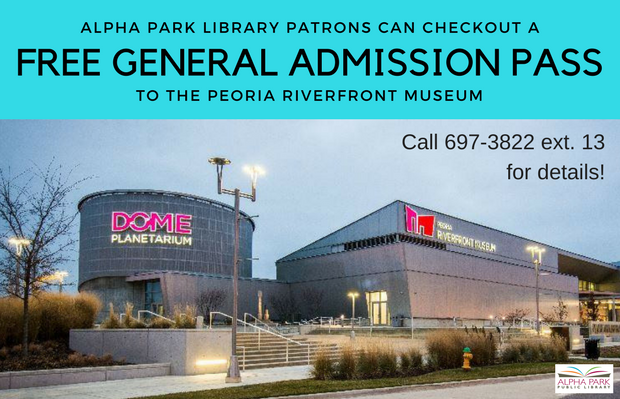 We’ve partnered with Peoria County Administration to bring informational adult programs to our patrons. A variety of educational programs will be available to the public beginning in September. All programs are free! Registration is required. Please register by calling (309) 672-6918. Thursday, December 13, 6 p.m.
Peoria County is a leader in sustainability, to the benefit of all residents and visitors in our region. The County's Recycling Educator will describe government efforts to conserve resources and preserve our environment for future generations. Participants in this workshop will learn specific actions they can do at home and work to improve economic, environmental, and social sustainability. 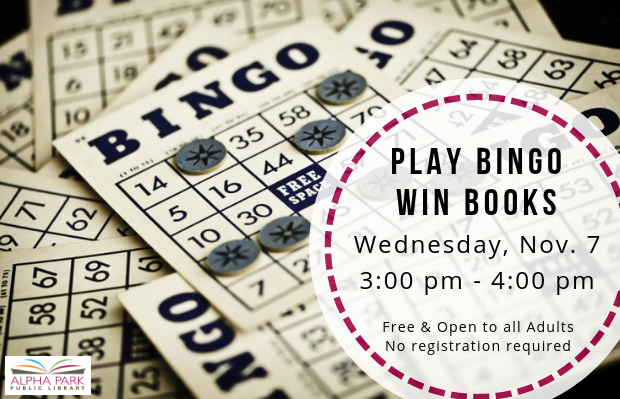 Wednesday, November 7, 3—4 p.m.
Join us at the library for Book Bingo! Bring some friends, play Bingo, enjoy snacks, and win books! FREE. Registration is not required. Call the Information Desk at (309) 697-3822 x13 for more details. 1st Monday of Every Month, 7 — 8 p.m.
Come join the Cookbook Club and share delicious recipes made by other library members. 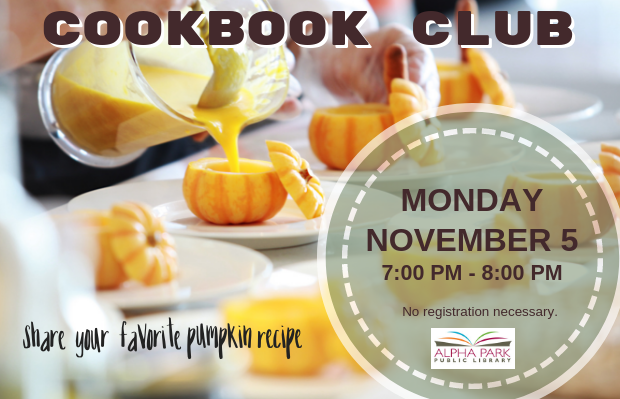 Bring a copy of your favorite recipe, and a sample if you wish, to the Cookbook Club and share it with the group. All adults are welcome to attend. Register for this program by calling the library at 697-3822, ext. 13. There’s still time to snag the 2018 Reading Challenge worksheet at the library and complete it before December 31! Participants only need to complete 30 of the 40 challenges and then return the form to the Information Desk to receive a prize. All participants who complete the challenge will also be entered for a Grand Prize drawing of a $50 Kroger gift card! Contact the Information Desk at (309) 697-3822 x13 for more details. Are you fascinated by family stories? Have you ever been hooked on history? Wanna get gripped by genealogy? Genealogy is one of the fastest growing hobbies in the country. 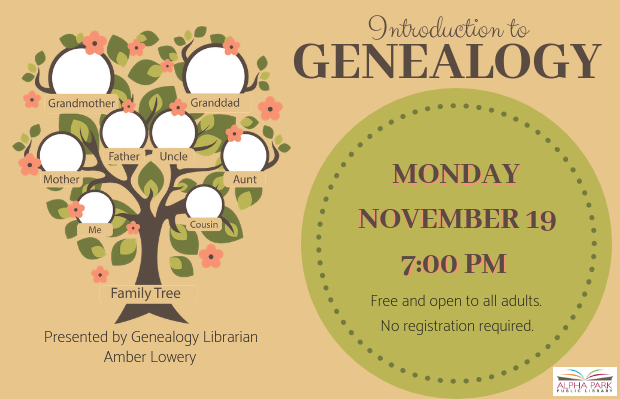 Join us for an exciting program presented by Genealogy Librarian Amber Lowery on getting started in discovering YOUR family history. Learn how to use online and traditional records to trace your family branches. Get tips and techniques for keeping your research organized and safe. Find out about avoiding rabbit holes and busting brick walls. November 19 at 7 p.m. FREE. Contact the Information Desk at (309) 697-3822 x13 for further details. Monday, December 17, 6—7:30 p.m.
Bring your friends and plan to meet new ones! 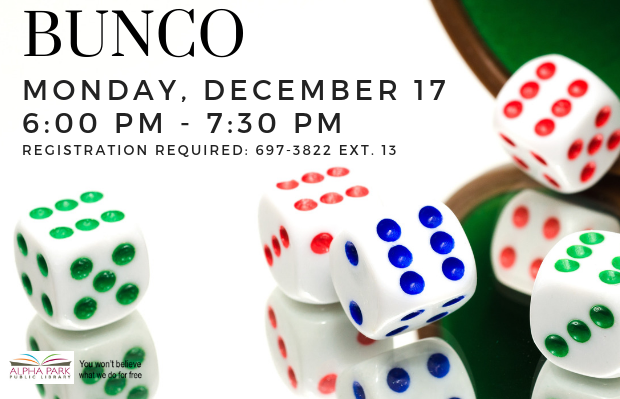 Enjoy a night full of BUNCO and snacks. FREE and open to the public. Space is limited and registration is required. Call (309) 697-3822 x13 to register and receive more information. 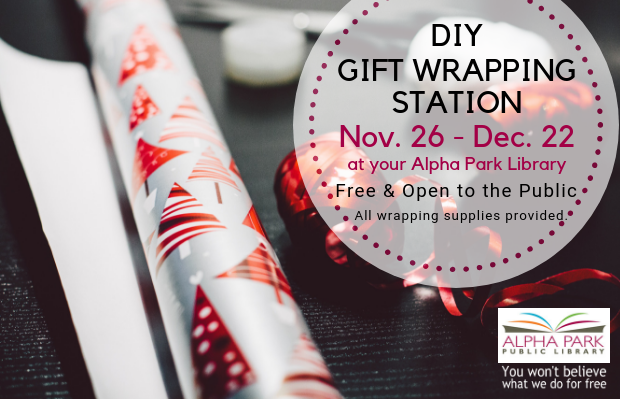 The Alpha Park Library wants to decrease your holiday stress and increase your cheer! Bring your gifts into the library and use our wrapping station for free. We will have an array of wrapping paper, ribbon, tape, and scissors (as supplies last). Come and smile awhile! 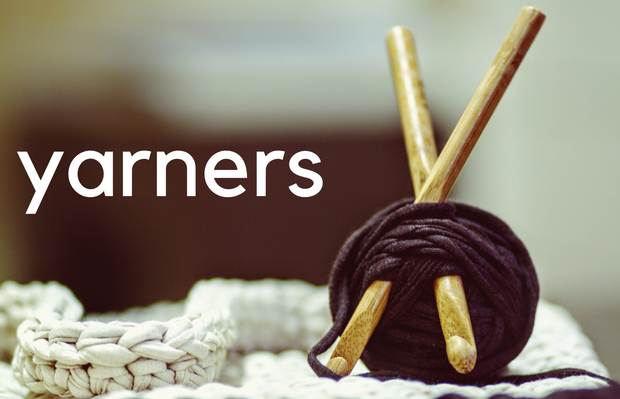 The Yarners and Needlers meet every Tuesday to work on projects of all kinds including knitting, crocheting, embroidery, tatting, quilting, mending, and much more. This program is free and open to the public. Want more information? Give Marla a call at (309) 697-3822 x24. Copies of the books are available for check out one month before the discussion. Please let us know if you prefer a sound recording or large print edition of the book and we’ll try our best to get it. The Friends Always Come Through! The Friends of the Library have come through for us, once again. We needed a new laptop for use in teaching technology classes…and more. The Friends have purchased that laptop, thereby helping APL conserve its technology budget. Thanks! The Friends is selling more engraved pavers, before Christmas, for the lovely patio that they created on the west side of the library. Because of an increase in material costs, bricks/pavers now cost $35. They may be purchased at the Checkout Desk. Friends meet during the school year on the second Tuesday of the month at 10:30 a.m. Meetings last no longer than an hour, and have been known to be much shorter still. November 13 is the next meeting—no December meeting. Questions about the Friends? Call Amber Hopwood, president, at (309) 697-3097.